A duct leak isn’t something that will make itself obvious. They don’t make noise and they don’t drastically alter the HVAC system’s operation. Many homeowners go a long time before they ever realize they have an issue with the ducts. What finally makes the leak known is through a noticed increase in the utility bill. Even then, many might mistake this increase as a reflection of their own usage habits. This is where it can help substantially to have a smart thermostat in place, since they can help track your usage more accurately. Since a leak will drain some of the heated or cooled air out of your ducts, it will take more energy to get your home set to the desired temperature. This extra work is the reason your utility bill rises. If your recent bill has got you suspicious about leaks, the next sign can come from observing a lack of airflow from the vents. Simply test all of the air registers in the home by placing your hand in front. If you notice significantly diminished air from one or some of the vents, that could be an indication that there’s a leak somewhere in the ductwork system. You may have also noticed that some areas of the home are stubborn, refusing to change their temperature. These areas are called hot and cold spots. While these spots can be due to many things, duct leaks is one possibility. An indoor air quality expert can help you find out for sure. The average duct system has a lifespan of about 20 years. Many homes may already have ductwork installed in them, so essentially, the ducts are going to be the same age as the home. 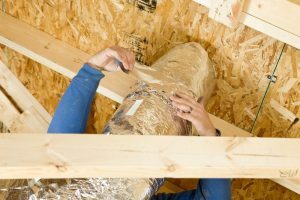 Unless you moved into a brand-new home, there’s a possibility that you’re living with some very old ducts. Pests have been known to chew holes through flexible ductwork. A poor installation—one that was done with low-quality materials—may be degrading. Ducts may have become knocked loose while working in the attic. Do you have leaky ducts? We can find out for you! Contact Hutchins Plumbing & Air Conditioning today to schedule a service.